85 think tanks from 45 countries attending, the 2016 Africa Think Tank Conference succeeded in bringing together more than 120 participants to discuss issues pertinent to both think tanks and African countries as a whole. Gathered in Marrakesh (Morocco), on 2-4 May, participants have taken up the challenge goal of bridging the gap impairing the relationship of African think tanks, covering a wide range of topics. Discussions covered the preservation and development of African think tanks, including key aspects such as governance and capacity building, independence and financial sustainability, strategic communication, partnerships and cross-fertilization with other think tanks, governments and NGOs. Participants also discussed how think tanks can help African policy-makers, influencers and populations face a number of common challenges such as fighting climate change, achieving the Sustainable Development Goals (SDGs) or ensuring countries benefit from free trade agreements, especially the CFTA (Africa’s Continental Free Trade Agreement). Think tanks can do so by helping countries improve their data collection capacity, methodologies and indicators, providing their negotiators with adequate training, taking advantage of tools such as the Economic Commission for Africa community of practice. 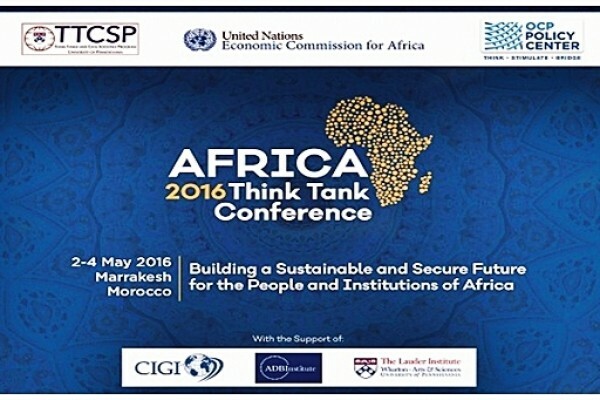 The Africa Think Tank Conference 2016 was jointly organized by the OCP Policy Center, the Economic Commission for Africa and the Think Tanks and Civil Societies Program of the University of Pennsylvania (TTCSP) under the theme: “Building a Sustainable and Secure Future for the People and Institutions of Africa.” This event was successful in encouraging the exchange of ideas and perspectives as well as the building of strong ties between a diversified group of African think tanks.